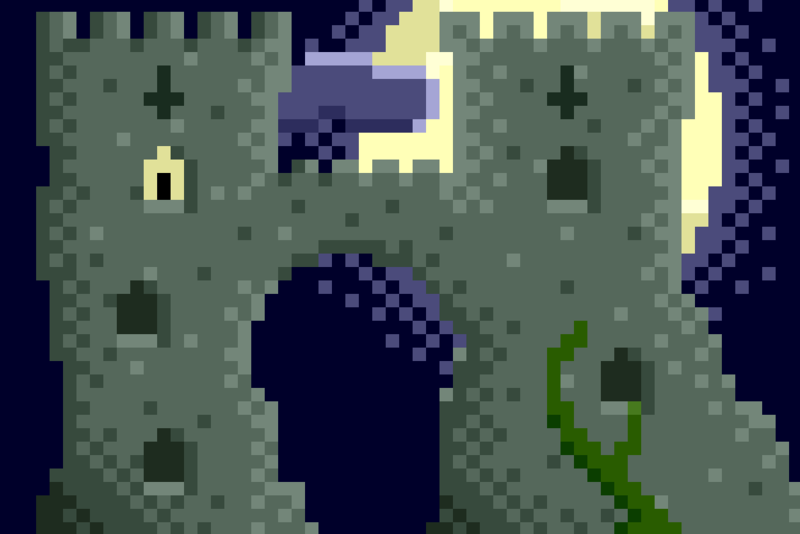 PixelShit Wednesday Part 4 – Castle Exterior. During a discussion on Twitter about how bad we all were at pixel art (or art in general) the idea was had to start a weekly… something where budding artists (provided they were terrible) submitted small, quick pieces of pixel art under the hashtag PixelShit. Pekka over at PrisonScape took the lead and regularly updates the PrisonScape page with each week’s challenge rules. I spent a lot longer on my castle than I did on many of the other pieces I’ve made. This one, all told, took me about 2 hours to make. I tried my hand at shading properly this time, and I’m really happy with how it’s come out! What do you think? I’m eager for constructive criticism or pointers. Got any links to great pixel art resources? Post them in the comments, and don’t forget to check out all the other great #PixelShit entries! This entry was posted in Uncategorized and tagged 2d-art, art, castle, dark, night, pixel art, pixelshit, progress, scary on November 27, 2013 by Nick.